"Craft" Beer Is Dead in 2018. So What Is "Independent" Beer Worth to You? When I first became obsessed with what we’ll refer to simply as “better beer,” just over a decade ago, it was still a point of time in the mid-to-late 2000s when those beers were often referred to as “microbrews.” If you weren’t around for that point in beer’s evolutionary cycle, it was a decidedly simpler time, because quite frankly, far fewer people cared that “better beer” existed. There were significantly fewer beer styles and breweries on the shelf. Everything seemed to have a much more pronounced air of novelty. The industry itself had far, far less exposure in popular culture. And notably, the word “craft” hadn’t yet become completely ubiquitous. Thus, “microbrews” and “microbreweries.” These terms, however, simply weren’t very useful or descriptive, primarily because all they implied was size. They implied that better beer was specifically the result of small batches rather than big ones; a useful tactic at the time for positioning the better beer market against the “macro” giants such as Anheuser-Busch, Miller or Coors (remember when those were all separate companies?). But the world changed. All of those companies eventually came to own small breweries of their own, of the decidedly “micro” variety. It was clear that consumers would have to look beyond “size” in gauging their expectations of quality. And thus, “craft beer” became the norm. That term, whose official definition has been closely guarded by the Boulder, CO-based Brewers Association, has been the rallying cry of the industry for going on a decade. Using the Brewers Association definition of “small, independent and traditional,” complete with many caveats (we’ll get to those), both the consumers and the brewers could have a go-to definition of who was “craft” and part of the fold, and who was “not craft” and essentially the enemy of an ideological war. It wasn’t perfect, but it was largely consistent. … but things keep right on changing. And the fact of the matter is this: The time of “craft” as a useful descriptor rapidly seems to be approaching its end. Thanks to the ever-diversifying shades of grey introduced by brewery buyouts and takeovers from a variety of sources, the single word definition of “craft” has become too muddled and ineffectual to apply to an entire industry—and with it, the ability of the Brewers Association to define the true meaning of “craft” has begun to slip away, as fewer breweries (and consumers) recognize the term as valuable, important or necessary. It seems to be time for another pivot and redefinition. That term seems to be “independent craft brewer.” These are the words the Brewers Association is throwing its influence behind for the future, and these are the words it would likely prefer to see replace “craft” in the long run, although matters are complicated by the fact that they chose to leave that word in the term, alongside “independent brewer,” in the seal they’ve made available for brewers to use. But make no mistake, “independent” is what matters here in their eyes, because of the clarity it seemingly represents. The official “craft” definition has only become more complicated, divisive and argumentative over time, but at least “independent” is somewhat easier to codify. But it also may represent a new line in the sand that consumers and breweries choose to willfully disregard. Let’s talk about why these terms matter. The definition of craft beer hasn’t just suddenly become problematic in the last year. Rather, it’s an issue that has gradually moved into the spotlight over time, until it finally reached a critical mass in 2017. It’s a definition that has occasionally been subject to change, and it’s hard to miss that those changes have usually coincided with either retaining or otherwise making exceptions to include some of the country’s largest craft breweries. Most visible was the 2010 increase of the definition of “small” from 2 million to 6 million barrels; a move that at the time essentially only affected Boston Beer Co., the makers of Samuel Adams. Given their size, it’s no surprise that the Brewers Association would want to keep BBC in the fold. But ironically, Boston Beer Co. is now in danger of losing that “craft” distinction once again, not because they’re exceeding the 6 million limit but because of the definition of the “traditional” requirement, which says that a “majority of its total beverage alcohol volume” must consist of beers “whose flavor derives from traditional or innovative brewing ingredients and their fermentation.” But because “flavored malt beverages are not considered beers,” and roughly half of Boston Beer Co.’s production is now Angry Orchard Cider and products such as Twisted Tea and Truly Spiked & Sparkling (alcoholic “spiked seltzer water”), BBC’s status as being a “beer brewery” first and foremost will now be challenged, and they could lose craft beer status all the same. Likewise, the “traditional” requirement has also been modified over time. In 2014, the requirement that a brewery have an “all-malt” flagship or otherwise primarily make adjunct-free beer—clearly a measure designed to ideologically separate “craft beer” from the likes of Budweiser (rice) or Coors (corn)—was lifted, which allowed Yuengling and its iconic lager to enter the fold and immediately become the largest brewery to bear the “craft” title in the eyes of the Brewers Association. Another supposed distinction between craft and macro beer had been erased. Yuengling is now technically the country’s biggest craft brewer. Less than 25 percent of the craft brewery is owned or controlled (or equivalent economic interest) by an alcohol industry member that is not itself a craft brewer. It’s this part of the definition that has caused what might be best described as “craft flight,” the exit of so many mid- and large-sized breweries from the ranks of craft into the vague world of the Other. Some, such as Goose Island, or Golden Road, or Terrapin, have sold themselves directly to the U.S. beer industry’s biggest players, Anheuser-Busch InBev and MillerCoors, and earned the scorn of many craft drinkers in doing so. 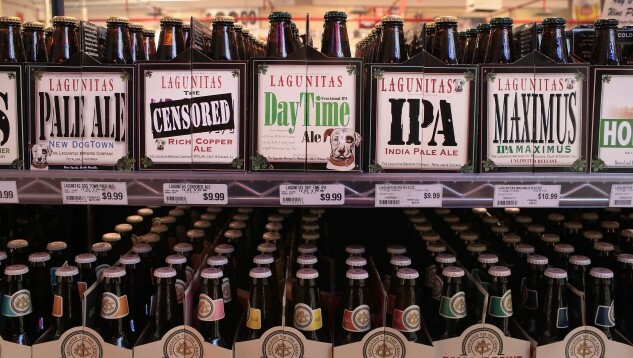 Others have sold to brewing conglomerates less directly defined by their opposition to the U.S. craft beer market, such as Lagunitas’ acquisition by Heineken. Then there’s the breweries now owned by other alcohol conglomerates, such as Ballast Point and Funky Buddha (Constellation Brands), or those who have sold only a partial stake, such as the 30 percent of Founders Brewing Co. and Avery Brewing Co. now owned by Spanish brewing conglomerate Mahou San Miguel. Every one of those companies no longer qualifies as “craft” in the eyes of the Brewers Association, but at the same time, those breweries acquired by private capital firms such as Cigar City, Oskar Blues (Fireman Capital) or Schlafly (Sage Capital) are still counted among the BA’s annual craft beer statistics—as are Boulevard Brewing Co. and Firestone Walker, now owned by Belgium’s Duvel Moortgat. And it’s these shades of grey that have become increasingly problematic, if not outright obtuse to the average consumer. It’s become the most obvious bar stool argument of the current craft beer market: Does it make sense for every violation of this hard and fast “independent ownership” rule be treated the same way? Should the beloved barrel-aged beers of Founders or Avery Brewing Co. really find themselves in the non-craft heap, treated with the exact same designation as a brewery 100 percent owned by AB InBev, because they’re 30 percent owned by a Spanish company that doesn’t even sell its own in-house beer brands within U.S. borders? Is Canadian Breakfast Stout in the exact same boat as Bourbon County Stout, and if CBS isn’t a “craft beer,” then how valuable is it really, to be able to call yourself craft? The best bottle of “non-craft” beer you’ll ever spend $30 to acquire. In trying to set clear lines that separate the world of craft from the world of their enemy, the Brewers Association’s definition has fallen behind the times. It’s not as if the craft beer geeks in the peanut gallery are ever going to be calling for the inclusion of AB InBev-owned breweries back into the fold—no one is angry in 2017 (or 2018) about the likes of Golden Road, Devil’s Backbone or Four Peaks not being able to call themselves “craft.” But Founders? Avery? Is 30 percent ownership by a Spanish brewer detrimental to the ethos of the craft beer industry? To the spirit of craft beer? And even if it is—would anyone in their right mind argue that it’s exactly as detrimental, to the same degree, as 100 percent ownership by AB InBev? Perhaps things are different in the bars where you’ve been having this conversation, but when I ask craft beer fans whether they think that Avery and Founders should be lumped in alongside Goose Island and 10 Barrel, I’ve yet to find one person who says “absolutely they should.” Everyone—including every brewery owner or professional brewer I’ve spoken to about this—seems to agree that there’s something wrong here that needs to be addressed. The shades of grey need to be acknowledged. In a way, it reminds me of a different issue, that of New England-style IPA’s inability to achieve recognition at beer judging events. Because of the strict, tradition-driven guidelines by which beer styles are judged at events such as the Great American Beer Festival (also operated by the Brewers Association), and the lack of a category that caters to the appearance and flavors prized in NE-IPAs, the odd result has been a near-total shunning of what has been the most sought-after style in the American craft beer market for several years now, which also leads to the perception of a philosophical gap between the consumer and the competition. You could say this is a symptom of the same condition; a staid philosophy that reasons “we must be sure” before implementing change. But that fear of being seen as “reactionary” may be hamstringing the organization’s ability to serve the craft beer industry and hurting their cache with the public. After all, if there’s one thing that has defined the craft beer market in the last few years, it’s the lightning-fast pace of change. New styles spring into existence and then become commonplace within a year, if not months. At some point, the definition/language has to catch up. EDIT: In March of 2018, the Brewers Association announced that three categories for “juicy or hazy” pale ale, IPA and DIPA will be added to GABF this year, for the first time ever. Definitely something that needed to happen, in our eyes. Does the Public Care About “Independent” Beer? Does the Industry? The question, then, is whether the Brewers Association and its member breweries that are currently using the “independent craft brewer” seal (more than 2,700 of them, which is quite impressive in only a year’s time) can complete a pivot into making the beer-drinking public care primarily about whether a brewery qualifies as “independent” as an important criteria for their purchasing decisions. Or in fewer words: Can you make people care enough about independence that they actually check whether a brewery qualifies under the BA’s “independent” definition before buying? My gut says that this is asking far too much from the average drinker, primarily because it has become harder than ever over time to keep track of who owns what. Even for beer writers like myself, writing a piece like this involves cross-referencing the ever-expanding list of ownership deals since 2011, and that’s simply not something that you can expect the rank and file to ever do in the beer aisle. It’s hard enough for writers to communicate the difference between buyouts involving private capital, macro brewing conglomerates and craft-acquires-craft takeovers—to the average six-pack buyer, it’s an indecipherable mess, and more work than they’re ever planning on doing. On one hand, that’s why the idea of an “independent seal” is so attractive—it’s designed to, at a single glance, give the consumer important information about a brewery’s ownership and what that fact is supposed to imply about the brewery. But there are so many exceptions. What about Founders and Avery, as previously discussed? What about a brewery acquired by a private capital firm that will more likely than not flip it to a bigger brewing conglomerate (like AB-InBev) a few years from now? And most obviously, what about breweries that simply don’t want to add a seal to their labels for aesthetic reasons? If you can successfully convince the consumer to care about the designation that the seal implies, then simply choosing to not put the seal on your bottles for design reasons could have a negative effect on sales. Should a brewery’s choice to not bear the seal because it clashes with their labels (or for any other reason) imply that they’re not independent, and thus not “craft”? Is it not a little bit ironic that the only way to show independence in this scenario is to display the same symbol as everyone else? The seal to denote whether a brewery qualifies as “craft,” according to the Brewers Association. Think of the average craft beer consumers you know—your father, your brother or sister—who don’t spend their time reading beer articles on the web. When they’re shopping at the package store, are they scouting for that little “independent craft brewer” seal? Do they even know what the seal is? Or are they making purchasing decisions based on which breweries or styles they know they enjoy? It seems far more likely to me that they’ve absorbed the lesson to “buy local” that has been preached for so many years, rather than an impetus to “buy independent.” And if you’re living in Grand Rapids, that probably means buying Founders over beer from Chicago, or Cleveland … even if your hometown local is no longer “craft,” and the out-of-towners are. Allow me to switch gears for a moment, to present an example of what I believe is flawed thinking on this issue. Recently, while having a conversation with someone from a state brewers guild, the topic of the Avery sale came up. After the sale, founder Adam Avery stated that he “didn’t care” if the brand still qualified for the Brewers Association’s craft definition, and went on to say he “couldn’t disagree more” about that definition. It was the interpretation of the person I was speaking with that Avery’s statement was one of necessity—that because he’d sold a portion of the company to Mahou San Miguel, he “had to” say he didn’t care about the craft definition, but in reality the company still wanted to be part of the fold. I disagree. If Avery still cared about possessing the label of “craft,” their statement in response to that question would have been this: “Of course we’d prefer to be labeled as craft, and hopefully the Brewers Association will look into their definition and find a way to make it represent craft breweries like us.” That would have communicated a desire for change and inclusion, but that’s not what Avery did. Instead, their choice was to throw the BA under the bus by implying that the “craft” label doesn’t hold any value to them. When they said they didn’t care about qualifying for that term, they were saying “we don’t need your craft designation as a tool to sell our beer.” And if their customers continue to purchase Avery beer, then each of those purchases becomes a vote of affirmation from the consumer base. Ultimately, that’s what it’s all about; whether people keep buying these brands. And if they still buy Blue Point, or Elysian, or Golden Road, or Wicked Weed, despite everything you can point to regarding AB InBev’s business practices, then what are the odds that losing “craft” status could ever affect the likes of Avery? I daresay that five years down the road, 95% of the people buying six packs of White Rascal at the package store will have no idea that the deal ever existed. And if that is the case—then really, what impetus does any brewery have to care about whether they retain that formerly valuable word, “craft”? The more breweries that make the decision that Ballast Point made, or Founders made, or Avery made, the easier that decision becomes to make for everyone else. There’s no REAL stigma here, as much as some of the die-hard craft beer geeks would like to pretend that there is. Even the breweries selling out to AB InBev aren’t punished for it monetarily by the consumers in any measurable way. In the end, we’ve entered a “post-craft” era—an era where these labels just no longer matter, and breweries make decisions about their ownership and future based solely on what makes the most business sense. Does that represent a withering of the old-fashioned craft beer industry ideals? Perhaps, but this is simply the result of an industry that has grown too large for a single trade group to influence with a single definition. In successfully creating so many craft beer drinkers over the years, the BA placed in their hands the true power to decide what is “craft” and what is not, via their buying power. As for our end at Paste, it’s not as if much will change. We’ll still cover the beer industry, and still note when one brewery is acquired by another. We’ll still make choices as to which breweries we support monetarily and which we don’t on a case-by-case basis, largely as a result of their reported business practices. Ownership will continue to matter in our eyes—but we reserve the right to decide that some ownership matters more than others. Every consumer has the same individual choices to make, whether they care or not. But one thing is certain: It’s no longer as simple as just saying “craft.” And it likely never will be again. Jim Vorel is a Paste staff writer and resident beer guru. You can follow him on Twitter for much more drink writing.